The iPod classic 3G is one of Apple's original products that commonly needs repairs. 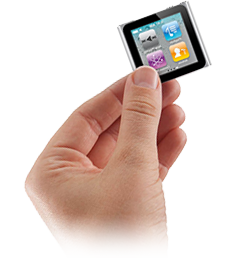 The iPod Repair Centre provides affordable repair services for iPod classic 3G devices. One of the most common types of problems with iPod classic 3G devices is that the front of the screen will become damaged. This often happens when the device is dropped on its front side. The screen can get damaged and cracked quite easily. The iPod Repair Centre provides affordable repair options and we happen to cater to the iPod classic 3G device. Whether you have a broken screen, headphone socket or so other problem we�ll offer you a quick solution and repair. Simply get in touch with us today and we�ll do our best to help!